The competition took place in Düsseldorf, Germany in November 2018, with 80 participating ensembles. For more information about the 2018 International Rubinstein Competition for Chamber Music, click here. It was a privilege to be a faculty member of the Nacionalinę moksleivių akademiją summer session in August 2018. With my colleagues from Trio Agora, we worked with bright, talented, and hardworking students for ten days in beautiful Nida, Lithuania. I'm happy to announce that I've joined the Kaos quartet in the 2017-2018 season. Looking forward to many great projects! We were honored to have been awarded the 2nd prize at the Luigi Nono chamber music competition, held in Rivoli, Italy. It was held October 20-22 in two rounds, and we had a wonderful time getting to know Rivoli and the surroundings. We enjoyed beautiful New Zealand, and concerts in Auckland and Wellington! Happy to have completed my studies at the Koningkijk Conservatrorium with this final exam in the main hall of the conservatory. What an inspiring week in Prussia Cove, studying with Ralph Kirshbaum and combining music and nature for an unforgettable 10 days! Thank you to the Mons Conservatory Orchestra under the baton of Romain Corbisier for a wonderful experience performing Schumann's Cello Concerto! On January 20, 2017 the Belgian radio station Musiq3 broadcast the January 13 concert with Frank Braley conducting the Orchestre Royale de Chambre de la Wallonie, Salle Arsonic, Mons (Belgium). 35:30 marks the beginning of Haydn's C major Cello Concerto. Cadenzas by Joel Hoffman. An inspirational masterclass by Gary Hoffman on Tchaikovsky Pezzo Capriccioso and Beethoven Variations on "bei Männern, welche Liebe fühlen." 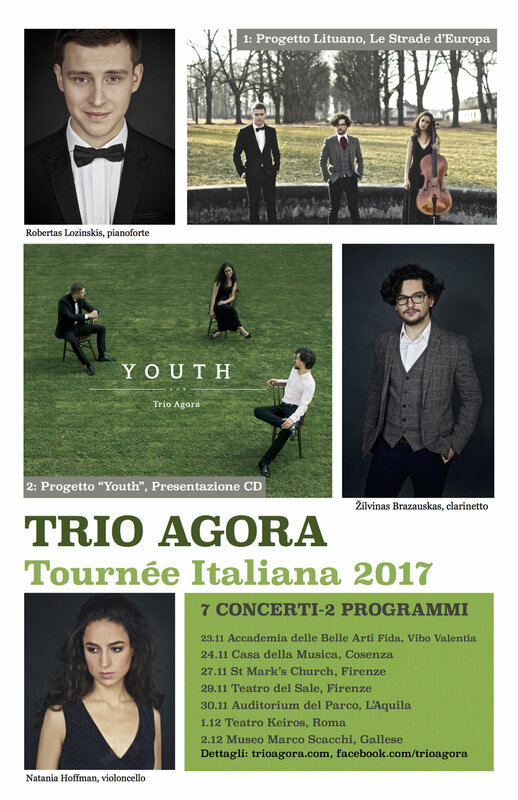 1st Prize, international competition "Giovani Musicisti, Città di Paola"
Category: string instrumentalists (no age limit). A beautiful setting for the competition, which took place December 3-18, 2016. Great memories from the S. Francesco di Paola sanctuary overlooking the sea, and the city of Paola, Calabria. What a pleasure and honor to have been part of the first "Città di Cremona" competition, October 1 and 2, 2016, as part of Cremona Mondomusica, a fantastic international musical arts fair in Italy. This prize was awarded to top participants of each instrument participating in this masterclass in beautiful Belém, Portugal. I had the pleasure of studying with Gary Hoffman. It was great to perform with Žilvinas Brazauskas in Nida's Catholic Church. Our program ranged from Villa-Lobos to Bártok, and we were happy to give the Lithuanian premiere of Joel Hoffman's "Bitter Lemon Suite". Great memories from such a beautiful country! This website wouldn't have been the same without the wonderful artwork of Sylvia-Mayoni Behrens. Vielen Dank, Mayoni, für deine Kunst!